Keeping the best of both worlds in the face of urban sprawl. In the still of an early Saturday morning one could sit at the hub of the Agritopia community, squint their eyes a bit, and conjure the image of a tractor rolling up to the machine shed for a tune-up. Instead of a rumbling engine, the happy sounds of families pushing strollers, pulling wagons or grasping leashes gradually displace the quiet. The doors to the machine shed-turned-coffee shop sweep open releasing an aromatic wave of coffee and pastries to welcome a light-hearted weekend breakfast crowd eager to leisurely linger in the cheery, open space. Joe Johnston joins the crowd, though he has distinctly different memories of lingering in this space than those being made on this day. He recalls when this was his father’s machine shed. He and his brothers would raid the parts bins spending hours modifying their Sears go carts and later motorcycles. His memory layers smells of oil, dirt, and the acrid smoke of a welder with the current aromas. And he couldn’t be happier with the change. Adapt and renew. Agritopia is a housing community in the biggest “town” in the United States—Gilbert, Arizona. It’s the geographic center of the east valley of the sprawling Phoenix metroplex. Suburban communities stretch 30 miles in every direction. It’s hard to imagine just two short decades ago this area was essentially the sticks, as Joe puts it…a simple farmstead on a sleepy dirt road where the Johnstons raised crops and a family. Thanks to Joe and his family’s forward thinking, that farm lives on despite the sprawl—just not in the form and function most farms do. 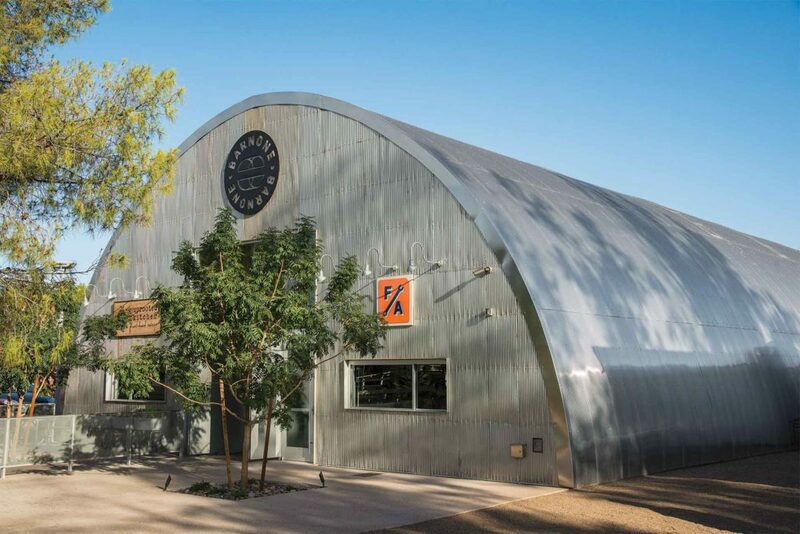 The Johnston farm Quonset hut is one of many buildings saved and beautifully for their new urban life. The outside remains familiar, but its interior now bustles with restaurants, creator spaces and a variety of specialty shops. The Johnston farmstead, once surrounded by fields of cotton, durum wheat and alfalfa, was soon to be engulfed by housing. The city plans and interstate routes mapped out in the early 1990s made it clear that when the dust settled there wouldn’t be much dust left to stir in the area at all. Joe’s parents, Jim and Virginia Johnston had farmed the land from 1960 to 1990 when his brother, Paul, took over. His brother Steve had gone on to be a rancher in eastern Arizona. Despite varying interests, they all wanted their farming legacy to continue. Instead of opting to sell off the land to developers, Joe, an engineer by trade, had an idea that beautifully blurred past and present, rural and urban. He saw a community with a working farm at its heart… a vision the family has seen to reality. Hoeing a new row. Today the farm feels and operates more like an urban village. The original farmstead acts as the gathering point for the community with all the preexisting buildings meticulously transformed to both retain the look of their agricultural heritage while serving the needs of a suburban community. The old machine shop is a bustling coffee shop. The house the Johnstons built has been expanded and transformed into Joe’s Farm Grill. Throngs of customers work their way through long lines at rush to get quick, fresh food. They can eat next to the fireplace where the Johnstons celebrated many a Christmas or in the shade of the massive tamarisk tree just outside. Its low-slung branches beckon the children that mill through the area, just as they did Joe and his brothers when they were children. 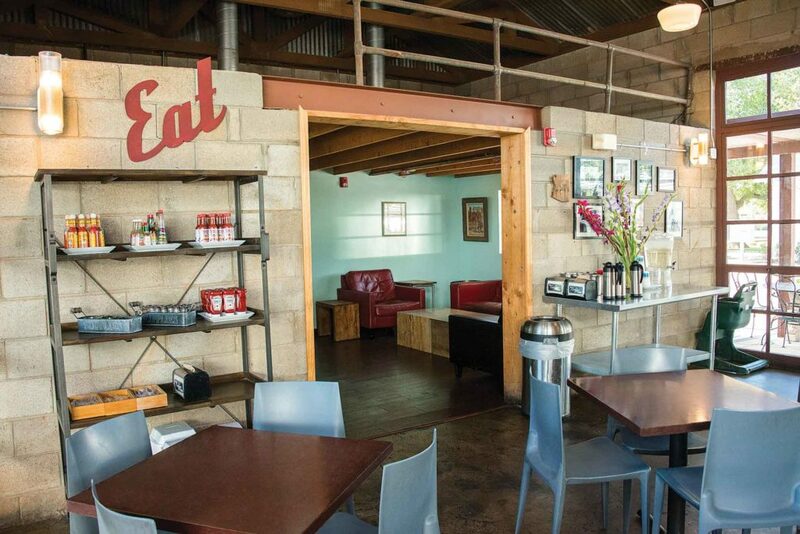 The coffee shop’s cinder block walls aren’t a trendy design option, they’re the sturdy support to a machine shed where engines from tractors to go carts were tinkered on. Arguably the most impressive transformation is that of their massive 50-by-160-foot Quonset building. The family fought against formidable challenges to keep the building and retain the grand sweeping arches of its ceiling while dividing the cavernous interior into spaces for makers. 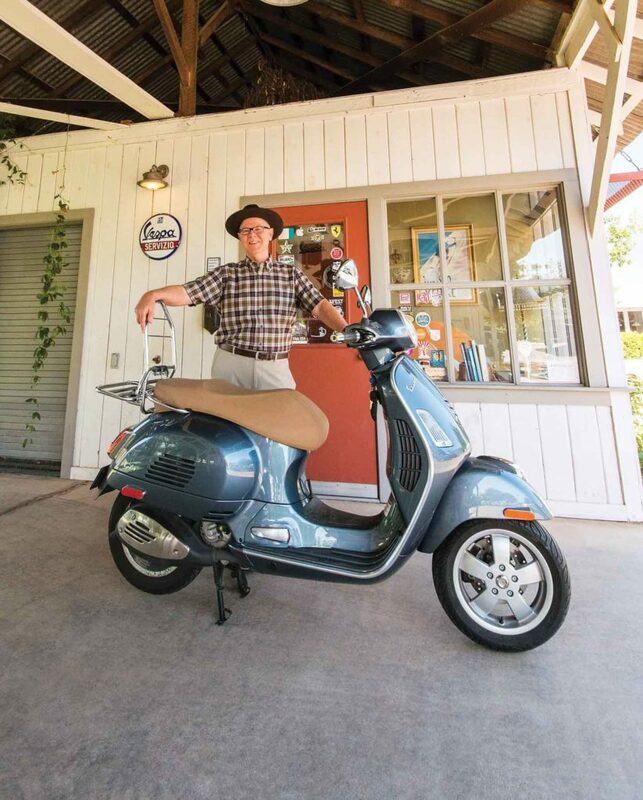 Known as Barnone—read as “Barn One” or “Bar None” depending who’s asked—it’s home to many craftsmen, including an engineering machine shop for Joe and a gunsmithing space for his brother, Steve. A cathedral where residents can catch a yoga class, grab a beer or glass of wine crafted on site, buy flowers, indulge in unique food at three different eateries and more. There are services and attractions for a diverse range of people and housing at price points to serve varying income levels. Four generations of Joe’s family live in the community. The same can be said of many other residents, such as Katie Critchley, the community’s farm director. Ideal for families, the community was designed to be walkable with tree-lined streets, green belts, and houses setup to facilitate front-porch interaction. “There’s a de-emphasis on the car. You’ll see lots of kids riding their bikes and people walking,” Critchley says. One of the most popular places to amble on those temperate days is among the acres preserved for farming. Agritopia was Joe Johnston’s vision as a way to retain a new version of the family farm. He was sure to retain space for family hobbies, like his Vespa shop. Staying rooted. The buildings weren’t the only bit of the farm lovingly retained and repurposed. The Johnstons set aside 160 acres for commercial farming and, thanks to some research, worked in legal protections giving the farm certain preferential rights. Walking paths divide fields growing certified organic vegetables and orchards producing citrus and stone fruits, Medjool dates and olives. The farm provides suburban dwellers a rare first-hand look at what it takes to produce their food —literally. Produce harvested from the acres supplies Agritopia’s restaurants. Residents can also sign up for a CSA to get weekly shares of the farm’s bounty. 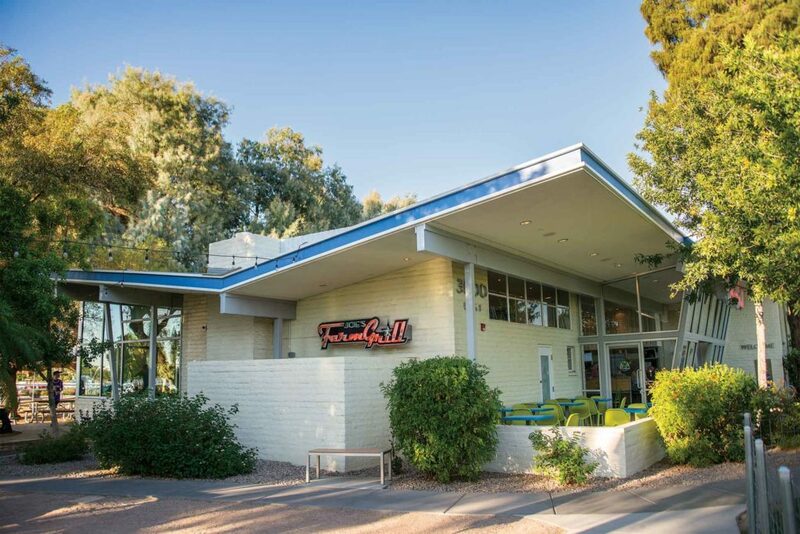 Or drop in the self-serve, honors-system farm store and pluck fresh fruits and vegetables from the tables or coolers. Joe enjoys listening in to conversations as residents wander the property often giving their own—sometimes inaccurate—farm tours. “There’s a lot of interest in the farm and it provides for great interaction. People are fascinated by it,” Joe says, noting there’s something about the natural beauty of growing plants that attracts people to the farm. What Joe, still a farm kid at his roots, appreciates is the opportunities for passive education. Residents have the opportunity to jump in and experience farming first-hand by volunteering. Or, test their own skills by staking claim to one of the many community garden plots. Pomegranate and myriad other fruit-producing trees build to towering Medjool date palms that corral and shade the community garden space. The gardens make for a fascinating Sunday stroll. Each plot yields not only produce, but an insight into the life of those who tend it. Plots range from pure production to mini show pieces complete with seating, shade, and clever decor. Plot 32 is labeled “Mimi’s Garden” and manages to turn a 20-by-20-foot square into a near-jungle experience. There is certainly plenty for “Mimi’s” grandchildren to explore with flowers and vegetables exploding from every available inch. Vines even ascend a pergola providing a cozy nook for those enjoying the space. The farm house where the Johnston boys were raised is now a popular eating spot for community families. Some spaces belong to serious gardeners while others seem to be a learning and experimenting space for families with young children. Even Joe and his wife, Cindy, have a plot. A fresh farmer. While the Johnstons enjoy their gardens, they’ve officially retired from farming. Instead, they hired Tim Colby to manage the farm. Colby may not be the most obvious choice. He had no farming background, but had a deep connection to food thanks to years in the restaurant industry. Restaurants and good food were his trade, but as he climbed the ladder it was clear there would be few hours for him to dedicate to the family he and his wife hoped to soon start. After a reflective hiatus from work, he realized farming was the perfect union of his passions for food and the outdoors. He reached out to several farms, but only Agritopia responded. After a year-plus stretch as a volunteer, they hired him on. Colby is thriving on the challenge, taking great joy in seeking out unique varieties and new crops. “I want to get good at growing the staples, but I want them to be unique. I don’t just grow tomatoes, I grow Gobstopper tomatoes or a variety known as Smurfs. I want to expose people to new things,” he says. While that’s the foodie in him breaking through, he’s also learned some hard lessons in farming. He works hand-in-hand with the restaurants to identify what they need and how he can supply it. An early adventure in salad mix production had him harvesting 700 pounds of lettuce per week when the restaurants needed only 100 pounds. It was a manageable hiccup about which Colby can now laugh. He’s spent hours reading books on farming, watching videos and picking the brains of the Johnstons. “Paul has been my main mentor. He has tons of experience and has taught me a lot of the basics such as how to use the equipment,” Colby says. Much he has to figure out himself, though, as today’s 12 acres of urban farm ground is managed quite differently from the commodity crops Paul raised during his years as the farmer. The farm is both different and delightfully the same. It’s allowed the Johnstons to retain their heritage and share it with others, like Colby. “We built a community with the best of urbanism and new agrarianism all mashed together,” Joe says. It may not be a traditional farm, but it’s a farm that honors and shares the farm tradition. With her work, she’s saving historic barns that are falling down.